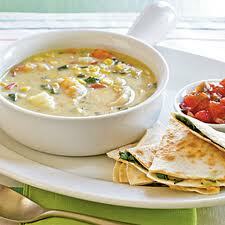 When the temperature drops…bring on the SOUP! Double the recipe and surprise a friend with a nice dinner! Thanks Kathryn! Melt butter in a large saucepan. Add onion and cook until tender, about 5 minutes. Stir in chicken broth and all vegetables. Bring mixture to a boil, and reduce heat. Simmer covered for 5 minutes, or until potatoes are tender. Remove 2 cups of soup and puree in blender or food processor. Return to saucepan with remaining soup. Stir in milk, cheese, chicken and seasonings. Simmer 10 minutes until desired serving temperature. Enjoy!